I love fresh-baked cookies. A lot of people do. I’m particularly stuck on the fresh-baked aspect and regular cookies which have been sitting around for a day or more are, well, just less interesting to me. I may poke at them out of boredom if I’m having a sweet craving. Store bought cookies in particular can sit on a counter for weeks without raising my interest. So I make my own cookies and gleefully eat them right out of the oven, but I also don’t need to be wolfing down two dozen fresh cookies in one sitting. Years ago when I was in this quandary of how to make small batches, I decided that actually mixing up small batches was stupid and frustrating, so I turned to the master of food longevity: the freezer. 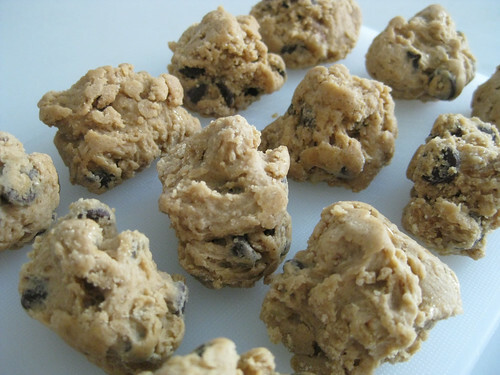 To capture the ability to fresh bake them, I make a huge batch of cookie dough*, and then dole them out in little cookie balls on the cookie sheet, but instead of popping them in the oven, I pop them in the freezer. (You can cram a lot of them on there too since you don’t have to space them out for cooking.) Once the dough balls have frozen through, I scoop them up, put them in a freezer bag and leave them be. When it comes time to eat the lovelies, just take out however many you need, set them on a baking sheet to thaw for about 10 minute and then bake away. I’ve found that this helps me control my weekly cookie consumption and is great for looking like a kitchen rock star when you have guests stop by. Who doesn’t love fresh cookies? * My favorite chocolate chip cookie recipe is from Savory Sweet Life. It uses coarse sea salt so that you get little salty bits in the cookie, which pretty much sums up my take on awesome. I love salty sweets. If you are skeptical, I suggest you give it a try and see, or you can wuss out and use regular salt.